The main gate of a castle in Japan is called ‘otemon’, which is elaborately designed in order to protect the castle against the frontal attack from enemies. Japan’s castles, surrounded with double or triple moats in most cases, are rather big. Therefore many bridges spanning the moats lead into the castle gates with a variety of designs and structures. The largest and most important gate among them is ‘otemon’ main gate. As this gate had the widest openings, the prospective enemies were supposed to attack here, the weak point of the castle from the perspective of defence. The architects of the day studied how to prevent the enemy corps from rushing into the castle grounds by way of this gate. 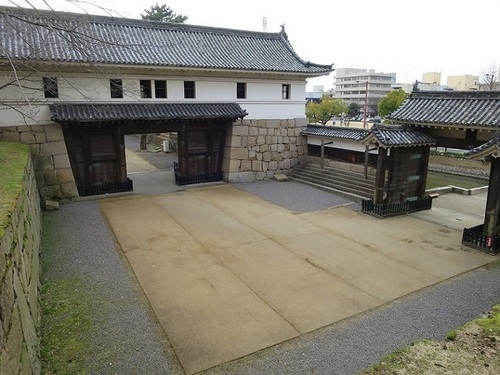 One of the ideal gate designs for this purpose was ‘masugata mon’ as shown in the picture from Marugame Castle, Ehime Prefecture. Two openings with doors were intentionaly arranged at right angles along high square stone walls. The inside opening has a scaffold on top, which was used to keep weapons and the soldiers shot the enemy from here in case of emergency. In addition, the frontage of the doors of the inside opening is wider than the outside, in that the number of the soldiers from the castle grounds always exceeded the enemy from outside in this square space.